Me: “— What am I going to do? P.: — What do you mean? M.: — Je ne les trouve pas ! Ils n’en ont pas ! P.: — They don’t have what? M.: — Des biscuits à la cuillère ! M.: — Ladyfingers! I need some to make my dessert! P.: — Can’t you make some? I guess P. was right. Totally right. Sam had giving me the hint somehow a while ago. I could totally make some. I needed them. When I used to live in France, I would just take for granted that if I wanted des biscuits à la cuillère, I simply had to run to my local supermarket. The store did not need to be special, as any supermarket or épicerie would do. Moi : — Bonjour, je voudrais des biscuits à la cuillère, vous les rangez où ? Vendeur : — Là-bas, dans le rayon des petits gâteaux. Me: “— Hello, I would like to buy ladyfingers. Where do you keep them? No fuss, easy and straightforward. I never questioned how accessible they were. But I do not live in France anymore. One thing I have learned from the fantastic opportunities I have to live overseas is that I am forced to step outside of my comfort zone. Every day I learn something new, even if there are things I will never manage to agree with, such as be tolerant about Bostonian bad drivers or understand why people I have met before sometime call our house to speak with P., but do not even say something like “Hello, it’s Michael P. here.. May I speak with P.?”. Instead, I hear a I-don’t-know-you “Hi, is P. there?”, as if I were some stranger living in the house or maybe the au-pair. Call me a snob, but I just do not get that! Never take things for granted. So things are definitely different from place to place, and country to country. As to my food searches, it taught me that it just takes a little more effort to get the ingredients that I want and need. And it is a good thing. Initially, the shape of this biscuit was round. What gave the biscuit its name? La cuillère, the spoon, used to place amounts of dough on the baking sheet. Starting around the 19th century, the shape changed to become long rather than round. A spoon would no longer be used but a decoration bag instead, which explains the new shape of the biscuit. Who created them? Antonin Carême. What are they? What we can describe as small finger-shaped sponge cakes. I needed wide short ladyfingers because of a dessert I am totally obsessed with, which I will talk about later. Made and tested, it is just waiting dans les coulisses (behind the scene) to be introduced. I ran a series of tests and researched for the best texture, until I settled with the following recipe. My ladyfingers turned out light and airy, probably not as pretty as store-bought ones, but just like I wanted them to be. The good news was that I could eat one, two, or three, and it was like I was eating nothing. Or hardly anything. I felt sweetness, softness, like snow meting in my mouth. After all, now that I think about it, ladyfingers used to be the type of biscuit my mum would give to me when I still had no teeth, to calm me down if I was crying. Not that this happened often as I can tell this to you, I was le bébé le plus gentil du monde (the nicest baby in the world), always smiling! I hope you believe me. Separate the egg yolks from the whites. Using a stand mixer, beat the egg whites with 1 Tbsp sugar, then progressively add the rest of the sugar until the whites are firm and form peaks. Sift the flour and cornstarch separately. Add the egg yolks to the whites, in the mixer. Add the two flours using a spatula. Be careful when mixing so that you keep the airiness of the preparation. Take a baking sheet and cover it with a piece of parchment paper, or use a silicone baking mat. Use a decoration bag to make little sticks, 2.5″ long as they spread a little. Make sure that you space them out. Sprinkle with confectioner’s sugar and let rest for 1 mn until the sugar is absorbed. Repeat a second time. Place the ladyfingers in the oven and cook for about 15 mns, or until they have a nice golden colour. Remove them from the oven and let them cool a little before placing them on a cooling rack. Séparez les jaunes des blancs. Montez les blancs en neige avec 1 càs de sucre, puis ajoutez le reste de sucre progressivement, jusqu’à ce que la texture soit ferme. Tamisez la farine et la maïzena séparément. Incorporez les jaunes d’oeufs à la neige ferme, toujours au mixeur. Ajoutez délicatement les 2 farines à la main, sans cette fois utiliser le mixeur. Prenez une feuille cigare et utilisez une poche à douille pour déposer la pâte sous forme de petits bâtonnets de 6-7 cm (ils s’étalent un peu). Saupoudrez de sucre glace, en 2 fois. (laissez la pâte absorber le sucre glace avant de saupoudrer avec le sucre glace une 2ème fois). Faites cuire au four pendant 15 mns. Sortez du four et laissez-les refroidir sur une grille. ils sont sublimes, une vraie pâtissière en chef. Tu as raison, Béa! Your ladyfingers are indeed best and they look beautiful to me. Especially with the bow. Wish I could have some to dip in my espresso! Tu nous prépares une charlotte? J’ai hâte de voir à quelle sauce tu vas les croquer ! Les photos sont sublimes, les bsicuits également. I tried to make a croque madame today, but i didn’t get the egg part right. As you are French, I was wondering if you could tell me how to do that. lovely, bea! i saw sam’s post a while ago also and had bookmarked it for a day when i have some time (i am on a tiramisu quest). looks like you produced quite successful results! cannot wait to see the end of this story. Tiramisu, charlotte? c’est de saison, très beaux tes biscuits et tu as vu, si vite faits finalement et tellement meilleurs que ceux du commerce! I’m sure yours are transcend the store-bought variety, but I just saw a package of lady fingers at Trader Joe’s! Superbes biscuits, je vais me lancer. 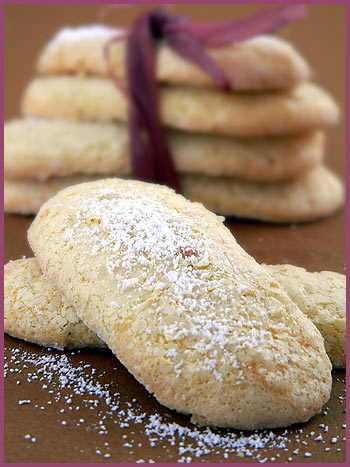 I would take your ladyfingers over store-bought ladyfingers any day! They look divine! Lovely… I can’t wait to see what you’re up to! As usual – great pictures and styling. C’est tout à fait le genre de biscuits que l’on ne pense jamais réaliser ! merci pour la recette, cela peut-être utile. I’m certain that yours will be better than store bought, at least store bought here in the US! They look gorgeous! je n’avais justement pas de recettes pour ce type de biscuits qui sont indispensables pour tout un tas de merveilleuses recettes, je note donc tout de suite la tienne! those lady fingers look divine! Hi Bea, I have been a regular but silent reader of your blog for some time now. Looking at the marvelous ladyfingers you made today though made me want to comment immediately. They look absolutely divine. I admire your photography skills. Everything you post has such a balance of color and texture. In this photo for instance you have paired the fingers with the ribbon and the fallen crumbs…beautiful. How did you get that brown background in the third photo? Un vrai régal les biscuits confectionnés par nos petites mains expertes en comparaison avec les ceuss en boite, il n’y a pas photos !!! J’ai hate de voir ce que tu vas nous concocter avec ces petits delices. Natalie, I knew you would believe me! Yeah! Ivonne, ah yes I bet! Loukoum, merci! ahah, comme Framboise, je garde la surprise 😉 dans quelques jours! Laurange, oui, bientot! Dis-moi, comme toi, je detesterais entendre ca au telephone! Je ne sais pas pourquoi ca m’enerve tant, mais vraiment, ca m’enerve! Mary, I sent you a mail! Let me know! iamchanelle, it is coming soon! Promise! Mercotte, ahah, patience 😉 Oui tu as raison ces desserts sont tres de saison! Suzy, thanks so much. I will check there. Wholefoods does carry some, but they are not the texture wanted, so maybe the ones at Trader Joes are different! Fanny, merci de ton gentil message! Lilo, oui c’est vrai, c’est bon et facile! Ashwini, thanks a lot for your sweet note. I am glad to hear you enjoy my blog! The brown background is actually a coloured piece of paper. Very useful to give a different background when you need one! Rowena, ah yes for sure, you are spoiled my dear! I think I need a trip to Italy! Mind you, Hawai is tempting as well. I was there so long ago that I need another trip! Merci Lemich, tres gentil a toi! Oui tu brules! Bon weeken. Ici, nous avons un long weekend! You French are ‘un peu mechant’, tying those cookies up like that! Trader Joes has lady fingers, do you have one nearby? Some things that were easy to ind in Paris are not so easy here – and vice versa – like baking soda! Tiny boxes from the pharmacy! Oh My, Bea these ladyfingers looks perfect. Tiramisu is my favorite dessert and i make it often,ie whenever i can i find imported ladyfingers and exorbitant prices !!! I am going to try this one out, WOW !!! Thank you !!!! Thanks Béa! 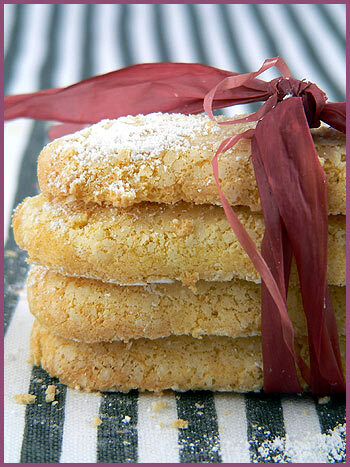 what a relief to find your website and this recipe of biscuits à la cuillère… ouf! I thought I could never make my favourite déssert (tiramisu aussi) here in UK! I’ll try this recipe asap…! Hi! 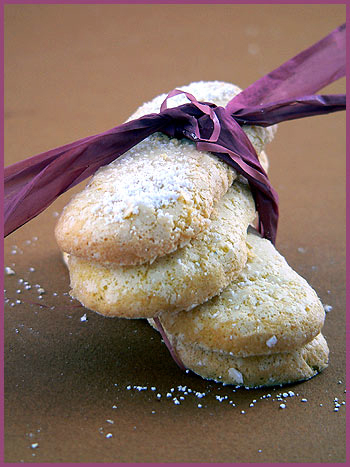 I did this recipe and it’s the most delightful biscuit I’ve ever tasted. I have this tea blog and this recipe is great for tea time! I hope you don’t mind but I put a link on my blog. Thanx for sharing this! First time on this website and I just have to say that it is so exciting to find such lovely amazing looking recipes. Thanks everyone for helping others find such great recipes and websites. I love love your site!!! It brings a smile to my foodie soul. I tried this recipe tonight..and I failed like always when it comes to baking. I don’t have a electric mixer so I did it by hand…and I thought it would turn out great bc I did get soft peak egg whites at least…..I will have to try this again once I get a hold of a mixer. I tried it again by hand and whisk every to stiff peak by hand…hard work but it turned out LOVELY!!! thanks!